Reload your magazines in a fraction of the time. Cleanammocans.com offers new condition, reusable, made in the USA, AR15 stripper clips at prices drastically lower than retail. Get 100 .223/5.56 10RD AR15 Stripper Clips or 200 .223/5.56 10RD AR15 Stripper Clips from a veteran-owned small business! 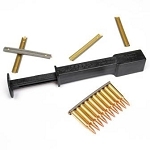 Our .223/5.56 stripper clips are unloaded by hand, stored indoors and are in glistening, like new condition. These are the same GG&G stripper clips currently purchased by the US military for use with the M4 carbine. While originally designed for the M16 family of rifles, mil-spec stripper clips work flawlessly in the AR15 with GI style or high-quality aftermarket magazines like the Magpul PMAG. Militaries have long utilized stripper clips to drastically reduce reload time in combat by allowing multiple rounds to be loaded quickly in a single motion. While useful in combat, stripper clips also have utility for recreational shooters and preppers. Please check out our blog or read below to learn more about the recreational utility of stripper clips. Place your order today! What Are Stripper Clips For? Stripper clips allow shooters to spend more time shooting and less time reloading! A significant amount of time is saved by grouping 10 rounds of .223 or 5.56mm ammunition together on a stripper clip to be loaded at once, compared to loading the magazine one round at a time. Most shooting ranges charge by the hour to shoot at their facility, resulting in some pretty costly reloads if you break down the average time spent at the range reloading magazines. The more time spent reloading, the less time actually spent shooting. Stripper clips are also useful during formal shooting classes or personal coaching sessions. Firearms instructors generally either charge by the hour, or provide instruction for a finite block of time. Stripper clipped ammo ensures you get the most value from your costly training class by minimizing the time spent loading your magazines. Shooting enthusiasts that participate in sanctioned matches or group firearms training classes also know that prep time between stages or courses of fire is sometimes pretty tight. Stripper clips ensure you are ready to be on the line when the range goes hot. Reduce your reloading time, when time is expensive, and ensure your carbine is always ready by pre-loading your ammo on stripper clips from cleanammocans.com before you go to the range! Stripper clips also offer benefits for SHTF preppers and those with large ammo stockpiles in search of a good way to organize their glorious cache. When it comes to best practices for long-term ammunition storage, most agree that packing your ammo in sealed, military grade ammo cans with a few desiccant packets is the best option. But many of us cringe at the disorganized mess that is left when thousands of rounds of ammunition are dumped into an ammo can. For many, the solution is to neatly organize the ammo into 10 round bundles using stripper clips. For those that purchased ammo to be used in the event of a SHTF emergency, what good is having all that ammo if you can’t load it rapidly when you need it? Be prepared, order a pack of stripper clips from cleanammocans.com today!